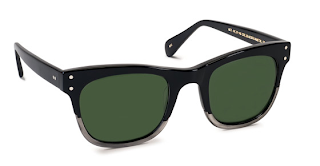 NEW YORK, November 4, 2013 — MOSCOT, a New York City institution renowned worldwide for its iconic eyewear — The MOSCOT Originals, MOSCOT Spirit, and MOSCOT Sun Collections — teams up with Ace Hotel to launch a custom design sunglass perfect for men and women. Inspired by Ace Hotel New York’s industrial design and the MOSCOT family archives, The ACE combines acetate and titanium metal for a unique, vintage-inspired look. A consistent gauge through the frame front and industrial titanium metal insures the frame ultra strong. This classic style reflects both the youthful culture and energy of Ace Hotel and MOSCOT. The frames, which are limited to only 400 pairs, will be sold in a custom made case with a special “MOSCOT for ACE HOTEL” chamois. The ACE can also accommodate prescription lenses and is available in Black-Gunmetal with G15 glass lenses. The ACE retails for $275 USD, and is available at MOSCOT shops, moscot.com, Ace Hotel locations nationwide and shop.acehotel.com. Ace Hotel reinvents hospitality to make something fresh, energized and human. We embrace and re-imagine classic buildings and interesting opportunities, creating a sense of history and place that pairs the pragmatic with the romantic. Our hotels are inspired by an affinity for the soulful and fueled by localized and handmade culture. For more information go to acehotel.com. MOSCOT is a New York City institution renowned worldwide for its iconic eyewear — The MOSCOT Originals, MOSCOT Spirit, and MOSCOT Sun Collections. MOSCOT infuses its unmistakably refined, downtown aesthetic with nearly 100 years of eyewear expertise and unparalleled craftsmanship to create its timeless eyewear. While now recognized as a global fashion brand, MOSCOT remains, at heart, a neighborhood opticalshop. All MOSCOT eyewear is handmade using the highest quality materials, real hardware, and hinges that are riveted through the temple and frame fronts to ensure the sturdiest construction possible. Every MOSCOT frame is available as ophthalmic eyewear or sunglasses, with or without a prescription, and is customizable in a variety of frame and lens color combinations and sizes. With nearly 100 years of eyewear expertise, MOSCOT carefully inspects every frame for quality control in its own labs, housed within its New YorkCity Shops, before dispensing eyewear to customers worldwide. These are some nice looking glasses. There are lot of people who are wearing glasses for fashion purposes only now. Nice looking glasses! I don't usually wear any but I sure do need to.